1) The walls and suspended gardens of Babylon, 2) The Egyptian Pyramids, 3) The Zeus Statue by Phidias in Olympia, 4) The Colossus at Rhodes, 5) The Artemis Temple in Ephesus, 6) The Mausoleum at Halikarnassos, 7) The Lighthouse of Alexandria (Faros). 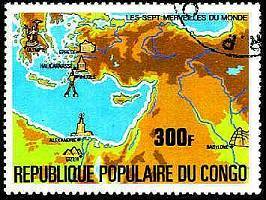 The above stamp, largely oversized, issued by the Republic of Congo, shows a map of the Mediterranean, with the approximate location of each of the known Seven Wonders of the World. I was delighted when I first found the very nice set of seven, issued by Hungary in 1980. The same theme was issued by Mongolia in 1990, and are shown alongside with the Hungarian stamps. Suspended Gardens of Babylon. Babylon: archaic for "The Door to God". The town is mentioned the first time about 2250 BC, and had its first Golden Era when Hammurabi made it the capital and built the wall of about 18 km around the city in the 1700th century BC. The Suspended Gardens are believed to have been made by King Nebukadnezar II around 575 BC. It is still disputed by scientists, whether the tall building in the background was supposed to be The Tower of Babel. The Egyptian Pyramids at Gizeh, Cairo. There are really 7 pyramids, the oldest one being the stair-pyramid at Saqqara, built in the 25th century BC. But the most well known ones are undoubtedly the three named Mykerinos, Chefren and Cheops, built by the Pharaohs of the 4th Dynasty. Zeus Statue in Olympia (Greece) by Phidias. Phidias, who lived about 500-430 BC, was a Greek sculptor and one of the most acknowledged artists of The Ancient Times. His colossal statue of Zeus, made from gold and ivory, has disappeared, and is now only known from contemporary coins and Roman marble-copies. I find it rather interesting that the Greek God Zeus has a pretty "Mongolian" look on the stamp from Mongolia. The Colossus at Rhodes, Greece. Rhodes is a small Greek island in the Mediterranean, directly south of Asia Minor. The statue was c. 30-35 meters tall, showing the Sun God Helios. The statue is believed to be made by Chares and was possibly erected c. 290 BC. It was demolished by an earthquake ca. 230 BC. Rhodes means in Greek "rose". The Artemis-Temple at Ephesus, Asia Minor. In Ancient Time Ephesus was a well known Greek town particularly known for its Cult of Artemis. The temple for this goddess was built in the 5th century BC. The Lighthouse of Alexandria, Egypt. In Ancient Times Faros was a small Egyptian island in the Mediterranean, just off the city of Alexandria. The enormous lighthouse, more than 100 meters tall, was built by King Ptolemaios II 280-279 BC. The lighthouse was in use until it broke altogether c. 1300 AC. Many other famous buildings of our time could serve as the 8th, 9th, 10th, etc. wonders, for example the Empire State Building in New York, the lighthouse in Belem (Portugal), the Opera House in Sydney (Australia); for the moment we will have to content ourselves with the antique world -- although long gone, these architectural and artistic wonders will still trigger our imagination of a world that is no longer there.